What is the dancing like? Our dances are reconstructed from period sources, and we strive for historical accuracy. For the Regency period, this means that modern contra dancers or English country dancers will recognize familiar figures, and Scottish country dancers will notice similar steps, but there are also a lot of differences from any modern dance form. Previous dance experience will probably help you to pick things up quickly, but remember to keep an open mind for the differences that 200 years can make. Likewise, our 1860s waltz is related to, but different from, a modern ballroom waltz and our 1920s charleston is different from a swing dance charleston. If you have no dance experience, we have the perfect event for you to get some! We offer classes and often build dance instructions into our balls. What dances will be too difficult for me to handle? If you are physically impaired, you might wonder if there will be dances you can do. We find that in every era there are some dances that are technically challenging and other dances that are pretty easy. There will be things for the hot-shot dancers and other things that are easy for all ages and types of people. The simplest dances require a brisk walk, that is, walking in time to the music. Sometimes they involve sliding to the side or walking in circles. If you come to an event, you will quickly see what you are able to do. No. The dancing we do is a fundamentally social activity. You are welcome to bring a partner, and many people enjoy our events the most if they have a small group of friends to dance with, but there is no problem with attending solo and meeting new people. We cannot insist that people change partners – some people dance with only a single partner as a matter of comfort or because of medical concerns or injury. On the other hand, people learn best from dancing with lots of different dancers. When we teach classes we encourage partner changes, and we hope that mindset carries over to our balls. As a rule of thumb, do not be afraid to ask a stranger to dance, but do not be offended if they decline. Do you use non-gender dance terms? 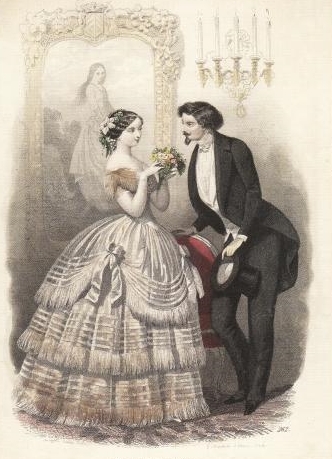 No, we use the terms “lady” and “gentleman,” that were used in Nineteenth Century dance manuals. We use these terms for the dance roles. A person in the lady’s role begins on the right side of a couple and generally steps off with the right foot. A person dancing the gentleman’s role begins on the left side of the couple and generally steps off with the left. You should pick a role and stick with it for the length of the dance. You can dance the same or a different role for other dances in the evening. You can wear clothing of whatever gender makes you feel comfortable and confident, but this doesn’t force you into one dance role or the other. For classes, wear comfortable modern clothing. For most of our formal events historical clothing is greatly admired but not required. If you wear something that looks classic and feels “dressed up,” you’ll do fine. Please, do not wear sneakers, shorts, jeans, t-shirts, or overly short skirts to our formal events (these are fine for classes, although sneakers will not be safe to dance in). Where can I get an outfit? We are constantly asked that question, but the answer is not easy. First of all, remember that period clothing is not required—if it is a question of showing up in nice modern clothes or not showing up at all, definitely come! That said, some people really prefer wearing historical clothes and want help finding them. If you are interested in making a historical outfit and have some sewing skills, there are many commercially available patterns (Past Patterns is a favorite because each pattern is an education in historical sewing. There are historical pattern companies that do great work. The big commercial companies have historical patterns, but they often use modern construction techniques can look a little costume-y.) Stick to nice cotton or silk fabrics, and you’ll come up with something beautiful. If you do not sew and would like to buy an outfit, there are usually many sellers on etsy and eBay that make Regency and other historical clothing. Some of these are much higher quality and more accurate than others, but there is so much turnover in sellers that it is hard for us to make recommendations. Look at lots of pictures and original garments to educate your eye before you jump into something. If you aren’t ready to make the commitment to dedicated clothing yet, consider hitting the thrift store and throwing together an outfit with the right silhouette. We live in New England, and that means snow is a real possibility. If the governor calls a snow emergency and tells everyone to stay off the roads, we will have no choice but to cancel the event. If the town where a ball is located calls a snow emergency and shuts down parking during the hours of a ball, we will also cancel the event. Otherwise, we will go ahead with a ball. You can check our home page, our Facebook page, and the Facebook event page for updates on the status of a ball. Tickets to our balls are non-refundable but they are transferable. When a larger ball is sold out, people who missed getting tickets often post on the Facebook event page to say they are willing to buy tickets from someone whose plans have changed. Write an email to Query@VintageDancers.org. or leave a voice-mail at 781-350-3399, and we’ll get back to you.